Anyway, this cleanser removes the stickiest and toughest BB creams thoroughly and at the same time moisturizes the skin. Its important that a cleanser does not strip the skin of its natural oil and moisture while thoroughly cleansing. Infact, it removes other makeup too! Check out its other functions! 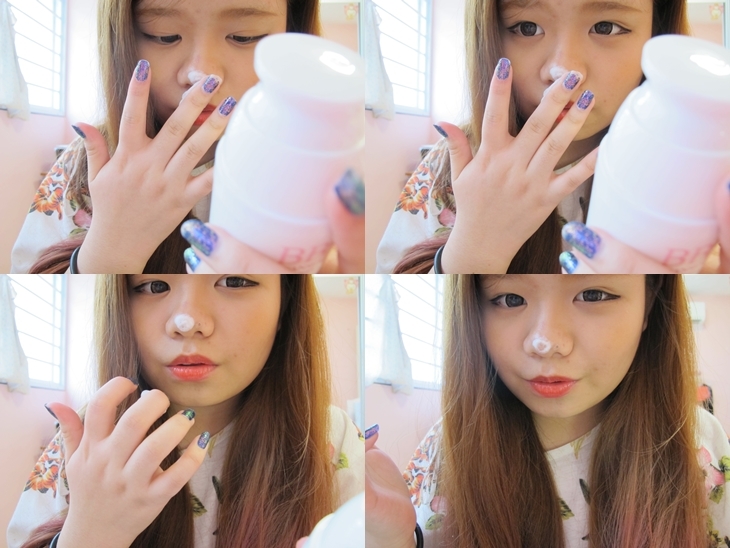 So I tried it with one of SKIN79's BB cream, which is a sample sized VIP Gold one from Joyce's party. Apply cleanser. *okay you don't have to use this much. Hahaha for illustration purpose only :P* Its quite a thick gel formula, but its not at all difficult to spread. Spread it over BB cream, wait for it to foam up. While waiting, you can sing a song. Foaming~ bubbles are quite dense. After enough foam is generated, rub gently. Best to be in circular motions on face. -Feels moisturizing and soft! Doesn't feel tight or squeaky kinda clean feeling. -Feels creamy and not soapy. -I tried it on both wet and dry face, works the same. -Do not need to apply a thick layer cos bubbles that foams up are dense! Awesome! *pictures and info extracted from press release. Top selling BB Cleanser! We love the Skin79 product because it really the pioneer of BB Cream and cleanser.